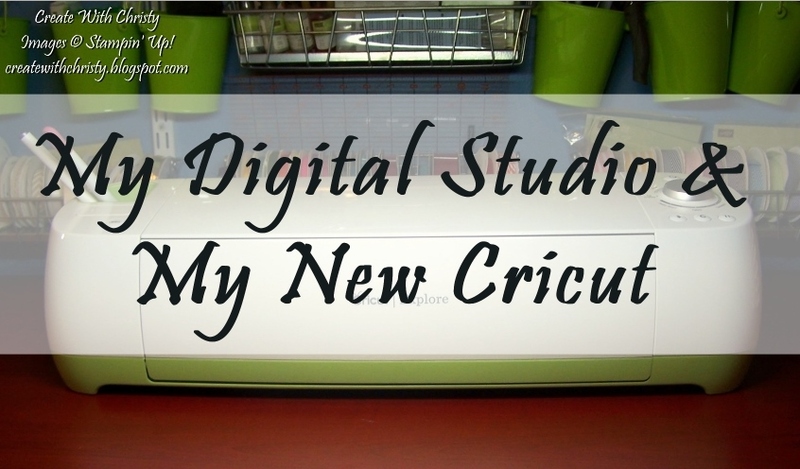 Create With Christy: My Digital Studio Meets My New Cricut! I've wanted to get a Cricut machine forever! I know you're asking, "You've never owned a Cricut machine"? I know, it's hard to believe! lol HSN had the Cricut Explore at $60 off last week, and I couldn't pass it up! I just got it last Monday, and I LOVE it! I didn't even realize until it got here that the white/green colors on the machine go perfectly with my craft room's color scheme! Score! I had never bought a Cricut before, because I knew I wouldn't have time to use it. I do create things that are strictly personal, but most of my creations are for my business. I could never use any Stampin' Up! products with the old Cricut machines, but that has changed! Now, with the newest machine, Cricut Explore, I can use it with My Digital Studio (MDS)! I can upload images I've made in MDS into Cricut's Design Space, and cut them out with my Cricut! With the new Print & Cut update for the Cricut Explore, I can even print out MDS images after uploading them to Design Space, and the Cricut Explore can cut them out perfectly! I haven't used the Print & Cut yet, but can't wait to do it. I've watched a video on how to do it, and it looks so easy. I'll let you know how it goes. The Cricut Explore came with a piece of silver vinyl, and I used it to decorate the outside of my Cricut. I uploaded some images I made in MDS, and cut them out with my Cricut. It was so much fun, and I really like how it turned out. I'm going to have to buy some more vinyl so I can decorate the top of my Cricut, too. The picture below is the right side of my Cricut. I used the Cheep Talk Stamp Brush Set in MDS to make this side. If you bought the original MDS when it came out in 2009, you already have this set. You also have it if you bought the MDS Express Booster Pack. If you bought the basic MDS Download or MDS Disc Software, you'll need to purchase this brush set. The next picture is the back of my Cricut machine. 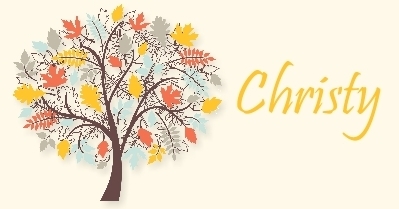 I used Cheep Talk for the bird and branch. The letters were made with the same MDS punches I used for my blog header at the top of my blog, Smitten Alphabet Punch - Digital Download. I made sure that the letters in each word would be attached when I made it. The last picture is of the left side of my Cricut. I used a digital stamp that was available to demonstrators a few years ago. I couldn't find it on the demo site, so I don't think it's available anymore. This one definitely took me longer to attach than the other two. I had to put all of the letters on individually. I lightly attached a paper circle to my machine where I wanted the words that were curved to go. I punched it out with my 1-3/4" Circle Punch, and only put a little adhesive on the top of the circle, making sure it didn't stick to the vinyl I already had down. If you don't have MDS, but would like to try it out before purchasing it, you can get the MDS 30-Day Trial for free!